Muay Thai, or Thai boxing can be said to be a really physical, full contact, combat sport. It is demanding in all aspects of combat. Therefore, there are certain precautions and safety measures that should be taken so as to avoid permanent damage to practitioners as well as minimize injuries that may ensue from combat engagement. It is important to know that using proper muay thai gear, whether professional or casually is really crucial. Mouthguard are therefore a mandatory equipment that Muay Thai fighters must always wear. As small and insignificant as it may seem, a mouthguard in combat sport is one of the most important equipment as regards safety measures. It is basically the only thing stopping professional fighters from having dentition that may somewhat look like a shipwreck and fighters visiting a dentist every other week. Considering the cost of these items ( mouthguard), in comparison to the permanent physical damage or dental problems a fighter or an average practitioner could incur from practicing Muay Thai without them, along with all the expenses of continuous surgeries and dental health care, getting a mouthguard which can prevent all these mishaps and accidents seems like an extremely huge bargain. As such, we will be taking an in-depth review of muay thai mouth guards that are considered the best and are extremely efficient at protecting the jaw, the areas around it and the dentition of Muay Thai practitioners. Picking the perfect kind of mouth guard for Muay Thai requires two major things: weight and type. Each of them are extremely effective in their own way and perform perfectly well as regards what they are built for (Protection of the dentition of Muay Thai fighters). However, each have their own pros and cons and are more suited to some fighters more than others, depending on sheer preference. However, Custom mouth guards are widely considered the better option of the two as they provide more protection and are better crafted to suit each individual’s dentition. Weight is also a determining factor in picking a mouth guard as thickness provides better protection against high impact which is a constant factor in Muay Thai. 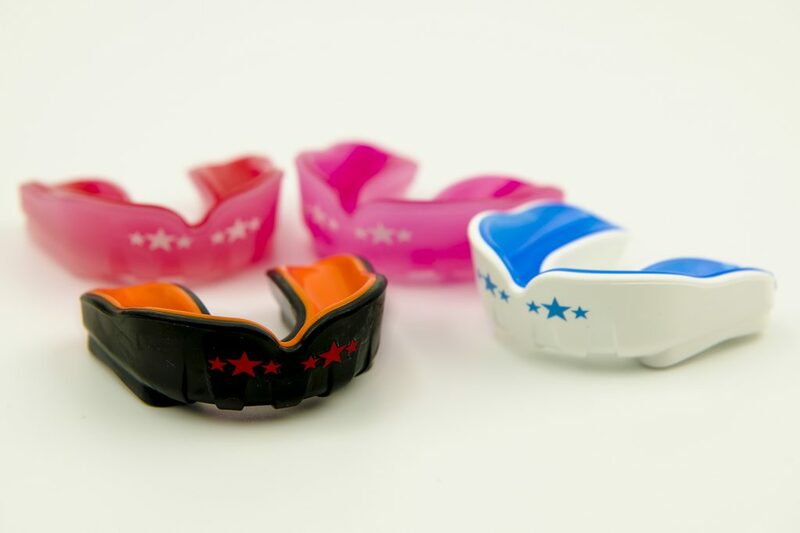 As the name rightly suggests, these are customized personally made mouthguards, meaning that they are designed specifically and specially to fit a particular dentition of one single fighter. It therefore provides the best fit as it is designed from a mold which is applied on your teeth to map out its exact look and dentition. As such, it provides the best fit and protection for all fighters. The pros include that you receive a muay thai mouthguard that fits perfectly and doesn’t move around or get removed in combat situations or during engagement, think of it as a new part of your mouth, an extension that has been added to protect you. It is easy to use. The cons include that it is much more expensive. As well as the fact that, it just seems a longer and significantly more stressful process in comparison to ‘Bite down’ mouthguards. There are impact custom level muay thai mouthguards that do not require a visit to a dentist as it does come with a self applying kit, but these are also significantly more expensive than boil and bite mouthguards and are made for professional fighters. Boil and Bite Mouthguards : These are by far the most popular and most used type as muay thai mouth guard or in any kind of combat sport. They are a lot less expensive than the latter option (Custom Fit Mouthguards) and do not require the help of a dentist or specialist, while still providing you with a great deal of protection. It usually comes with a self help kit, as well as step by step instructions on how to apply, create and use it. It however requires a gentle precision in creating and molding the mouthguard to fit perfectly. Usually created with a special kind of plastic, the process of making a bite guard is different from the ‘custom fit’. The internal layer of the boil and bite is usually thermoplatic, but sometimes with other products silicone or acrylic. As such, just as the name implies, the plastic is placed in warm water or in mildly heated water for a while. The plastic in turn forms a sort of squishy, mold-able substance which can then be squished into place over the teeth and gums of the individual. The wearer then molds it into place over the teeth and gums using their hands and mouth until it cools off and fits as a mouthguard. Pros and Cons:The pros include that they are efficient in protection and relatively affordable, it is also the fastest way to get protection for your dentition if molded properly. The cons include that, If not properly molded it may not cover dentition properly and therefore, may not provide an adequate enough protection, it also requires work and skill to mold. They are designed to give you an almost pristine, perfect fit, allowing for easy breathing and talking. Fast and easy to use impression kit, also includes paid postage to a dental lab. Venum as a sports company can be said to be experienced in the category for combat sports as they have been manufacturing a wide range of products related to combat sports and different forms of martial arts for years. They offer a full range of equipment for MMA, Boxing, Brazillian Jiu Jitsu, Karate and other forms of combat sports. Venum also sponsors a number of athletes and sports teams in combat or contact sports. Available in different color ranges, It provides a great deal of protection while allowing for free movement of the jaw, allowing users to speak and even breathe properly. It is made by OPRO, a sports company who is an official licensee of the UFC (UFC is the world’s leading mixed martial arts promoter). This mouthguard provides elite level protection and is suitable for all contact and combat sports, Rugby, boxing and even Muay Thai. It includes an extended 18 month $17,500 dental warranty. It also includes a Bio-master Antimicrobial layer to protect you against the build up of 99.99% bacterial growth. Comes with a mouthguard case. This comes with Gel-fit liners, these mold to the teeth for a well adjusted firm fit. It is built with a dual arch structure which disperses impact away from its original point of contact, it also provides Nano protection for both the upper and lower teeth. It is not designed for neither should it be used with braces.Latex Free, BPA Free and Phthalate free.Meets national and state high school rules, does not come with a mouthguard case.